Keeping horses active with proper nutrition during winter months is essential to maintaining their health. Winter can be hard on horses, from the cold temperatures to the close quarters of the barn. “Regardless of your horse’s job – be it competition or pleasure – keeping him active with proper nutrition during winter months is essential to maintaining his health during the off-season,” says Jennifer Kasten, DVM, technical services veterinarian for Tomlyn® Veterinary Science (http://www.tomlyn.com). Keep Moving: Fall and winter months are an important time for your competition horse to recover and condition in preparation for the next season, so keeping him moving is key. Have your horse walk forward with impulsion for 20-30 minutes per day to maintain joint mobility and strengthen his muscles. This can be performed in a number of ways such as arena riding, lungeing or using a hot-walker or an underwater treadmill if you have access to one. Stretch Out: Stretching exercises can help increase flexibility and rage of motion, improve performance and help prevent injuries. Speak with your veterinarian on which stretching exercises are most appropriate and beneficial for your horse. Catch Colic Early: Your horse has a very sensitive digestive system, which can become stressed during the seasonal transition. With a lack of green grass to graze, most owners will switch horses to hay which is much dryer. A horse also may not drink as much water as he does during hot weather, and he won’t be moving around as much when brought to stable. These can all lead to impaction colic which can be very painful for your horse, and if not addressed promptly, may be life-threatening. Dr. Kasten recommends making sure your horse stays hydrated by keeping water buckets clean and free of ice during the fall and winter months, and keeping him moving with regular exercise to help prevent signs of colic. 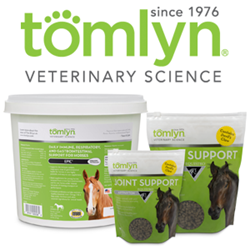 Tomlyn’s line of equine products are available in local feed stores nationwide. For more information and where to buy, visit http://www.tomlyn.com.